As relatives to the bee in the insect family Hymenoptera, there are over 20,000 different species of wasps. Unlike a bee, whose stinger usually falls out after a single sting, a wasp can sting multiple times, though only female wasps sting, while male wasps bite. Wasps come in a variety of colors, but most tend to be marked with yellow or orange stripes. A few types of wasp are considered to be particularly aggressive. About 50 people die each year from allergic reactions to wasp stings. Be careful around wasps and all stinging insects, even if they are not thought to be very aggressive. Don't disturb nests and be mindful of foods, aromas and bright colors that might attract some insects. The yellow jacket is a very aggressive wasp. Yellow jackets are mostly found during late summer and early fall months, especially August, making them a nuisance and danger at outdoor picnics, festivals and barbecues, where the smell of foods can lure the insect in proximity of humans. This wasp type is considered predatory and can live in colonies of 4,000 to 5,000. Yellow jacket nests are typically found in protected areas such as trees, shrubs, near roof gutters and under household awnings. Yellow jackets will aggressively attack en masse if they feel their nest is being threatened. Hornets are one of the most aggressive types of wasp, and many are able to sting through clothing and protective gear. 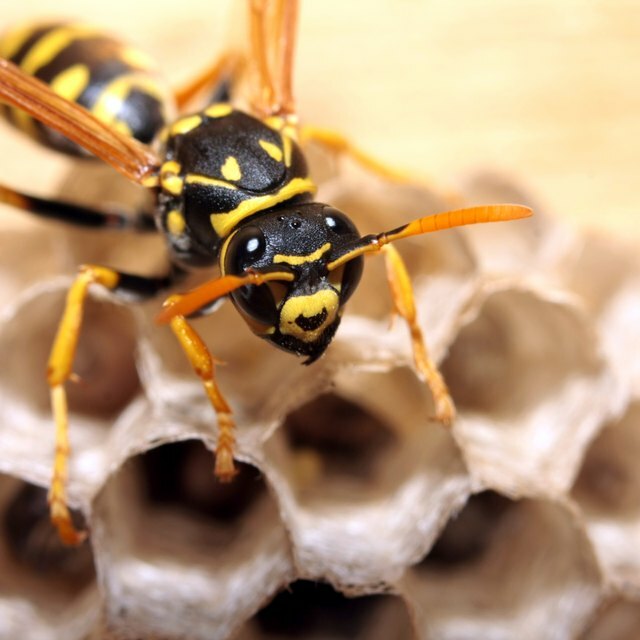 Like yellow jackets, hornets are very protective of their nests, which can usually be found in the ground, hollows of trees, tree branches and near roof gutters, among other protected places. Certain types of hornets, such as the bald-faced hornet, will protect its nest by employing two of its team to circle near the nest surveying the area for threats. Once these "watchmen" feel their nest is in danger, they alert their team inside, and all attack as a united group. Paper Wasps, which can be found throughout North America, are an aggressive type wasp who build their nests with chewed wood pulp, hence the name "paper" wasp. The insect can grow up to 1-inch long, and possesses a distinctive reddish-brown body with yellow rings and long legs that dangle during flight. The paper wasp is considered a social insect that is most active during the spring, summer and fall months. By November, all males and the original queen die within a nest, while the new queens burrow into the ground and wait for the winter to pass. The cicada killer wasp is larger than most wasps, growing to a length of up to 2 inches. Though this type of wasp is not generally aggressive, mating male cicada killer wasps can be highly aggressive and can be disturbed very easily. The insect gets its name from what it hunts and eats: the cicada. This species of wasp is mostly found during July and August in hotter climates where cicadas are present. Vogt, Crystal. "Types of Wasps That Are Very Aggressive." Sciencing, https://sciencing.com/types-wasps-very-aggressive-8587648.html. 10 April 2018.